Commercial Doors . . .
For an interactive guide to the options available, CLICK HERE. Also, we install a whole line of special application doors. Click here to see the whole list. For a summary guide to these doors, CLICK HERE. 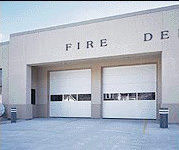 Click HERE to access our full line of commercial doors, size charts and specifications!